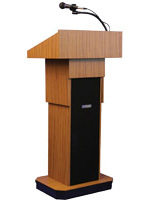 This executive adjustable medium finish podium is a user-friendly portable presentation fixture designed for public speaking in auditoriums, conference or convention halls, meetings and board rooms. 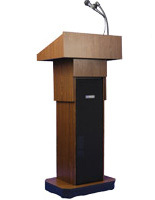 A pneumatic height control dial adjusts the presentation stand from 39" to 45" tall as needed. 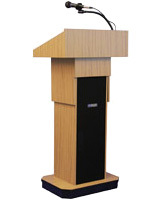 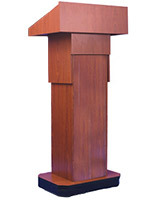 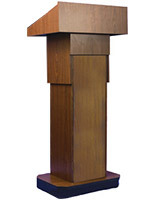 This portable adjustable medium finish podium is made of natural wood covered with a medium oak finish laminate that offers style and durability. 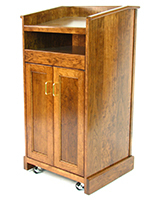 The rolling presentation pulpit has four hidden wheels, two of which are lockable for stability during use. 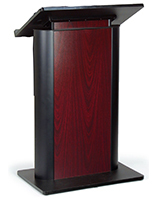 The medium finish podium's oak laminate will complement any auditorium, conference or meeting room or other public location. 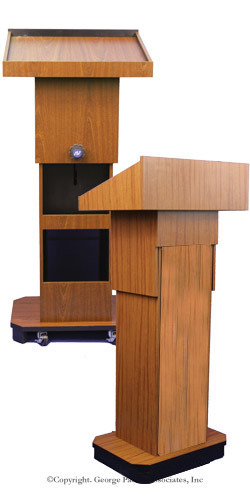 The versatile portable presentation pulpit can be ordered with a variety of built-in sound options for maximum usability in any environment.